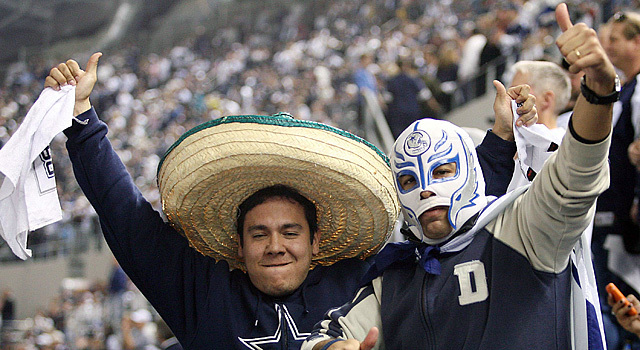 Published: June 14, 2011 at 09:41 p.m.
Just kidding, the Cowboys don't make this list. Besides, is anybody really born a Cowboys fan? After taking a look at the most disappointing franchises to cheer for on Tuesday, it's only fair that we celebrate the best teams to root for. Fair is fair, right? Again, the rankings were broken down scientifically and (somewhat) objectively. I measured each team by the owner, city life, stadium, fans, weather, uniforms, and history (on a scale of 1-5). The results weren't that surprising, but there might be a few teams you didn't think of that snuck onto the list. Philadelphia Eagles. The fans in Philly are great. The pre-game pretzels sold in the parking lot are awesome. Weather hurts a little bit, and the ownership seems fine but not elite. San Diego Chargers. Great weather. Great fans. Great city. But the threat of moving to Los Angeles looms, especially when you consider that the last team to move from San Diego to Los Angeles was the Clippers. The Seahawks have awesome fans (maybe the best) and the game-day experience is unmatched. The stadium is great (and loud), and Seattle is a great town. And when your owner is the co-founder of Microsoft, that has to be considered a plus. The only ding? They need to go back to their old-school uniforms. The Chiefs' fan base has always been, to me, one of the most underrated. Chiefs fans are never discussed among the best, but they are peerless when it comes to support. Arrowhead Stadium might have the best food, both outside and inside the stadium. If a couple of those Marty Schottenheimer-led teams had broken through, the Chiefs could challenge for the top spot. The Saints have always had some of the best fans in any sport, even dating back to when the team was dreadful. They certainly deserve all of their recent good fortune. The ownership is great, and the city life is nearly unmatched. Plus, those are some underrated uniforms, especially the road whites. This one was easy. This is kind of bittersweet because I was born into a Bears family. And let me tell you, the 1985 NFC Championship Game was no fun. The Bears have it all, though. Great ownership. Great city. Rush Street. Hall of Famers from across the decades. Winning only one Super Bowl with that great defense keeps them out of the top two. This one is rather obvious. The ownership is out of this world. The fans are everywhere. And the team keeps winning the right way. The Steelers never make the splashy free-agent signing, but the team is competitive nearly every year. And from 1969 to now, there have only been three coaches. That is unbelievable. Was there ever a doubt? The Packers nearly earned fives across the board, but the weather can be a little harsh for some. The Hall of Famers. Lombardi. Lambeau Field. There really is no doubt. And the best part about being a Packers fan? You come out of the womb as part-owner. "Pick Six: Who is the NFL Justice League?..."